The 2016 Lower James River Expedition: Day 2! We began our day as usual; packing up camp, jumping off a dock, and setting our from Fort Pocahontas. The goal for the day was completing ten miles and arriving at Chickahominy Riverfront Park. Before leaving camp however, we discovered something new. 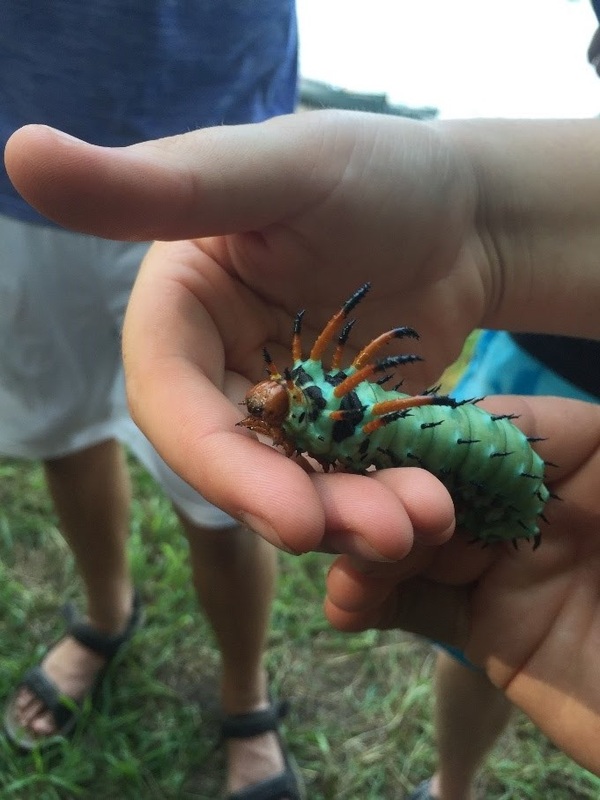 We discovered an unusual little creature named the Hickory-Horned Devil. 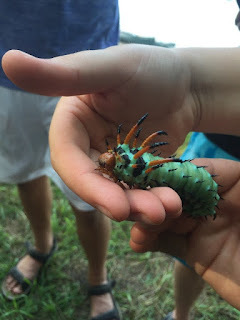 This guy was a large green caterpillar with black spikes poking out from his back, and right above his head had had larger orange spikes with black tips. This made him look poisonous, but after doing a little bit of research we found out that he was completely harmless. Throughout the day paddling ten miles our collective group saw twenty-six bald eagles and sixty-two tires. That means in all that we have seen forty-five bald eagles and one hundred and twenty four tires throughout two days at camp. Right after lunch we took a swim in the river and found over thirty mussels. 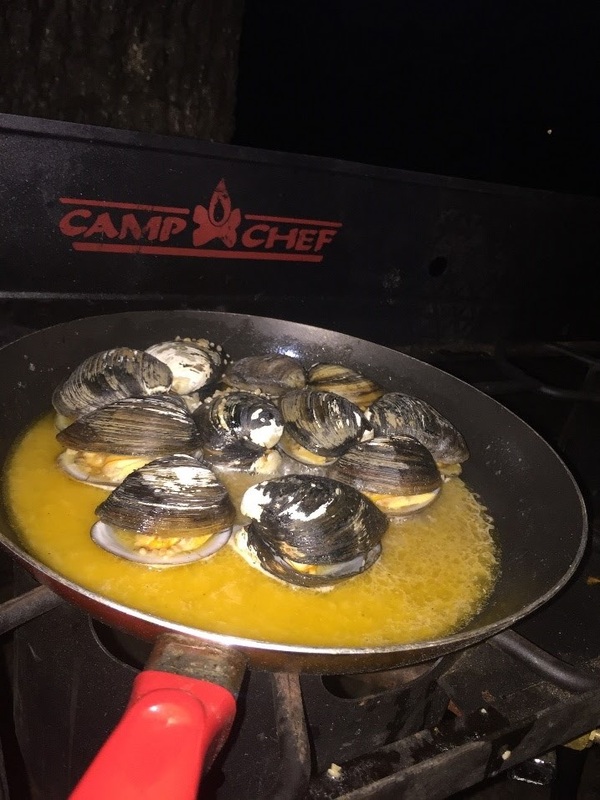 We put them in the canoe and cooked them up for dinner with some butter, garlic, and old bay. The 2016 Lower James Expedition: Day 1! Even though the lower expedition participants didn’t get a good sleep, once they saw the sunrise, they knew that it was going to be a great day! We started off the day eating breakfast served by Chase and Taylor. After breakfast we brought all of our stuff down to the water. Once everything was loaded up, we started our adventure down the James River. Everyone but Kyle was in a canoe. We canoed about six miles before taking our first break on the water. The whole group voted to not have lunch and waited to eat it later. 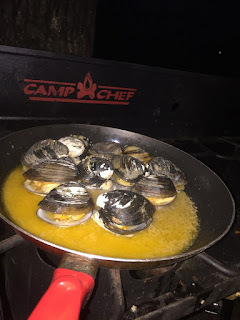 A couple minutes after we stopped, we ended up finding some mussels on the river’s floor. Around 4 o’clock, we had our lunch. Our lunch consisted of wraps and fruit. We all felt re-energized and ready to go the rest of the way to our campsite. We ended up seeing a ton of Bald Eagles and tires (very interesting…). Once we got to camp, we got to experience a demonstration of fish shocking. After the demonstration was finished, some of us got to hold 20lb Cat Fish. We bomb-proofed our campsite after eating pizza and now we’re headed to bed. Ryan Milby, former Expedition Land Support Intern and current DGIF fisheries technician shows off a large James River blue catfish! Long paddle days are fueled by good snacks! This grasshopper found a great spot to watch the sunset. Fort Pocahontas campsite has a lovely sand beach and plenty of views! The team paddled an impressive 21 miles from James River State Park all the way to Howardsville. We overcame storms and class 2 rapids to get to our destination. The scientists of the group observed the macro-invertebrates of the James River today. We were able collect various species by using a kicksein. We observed stoneflies, mayflies, water pennies, hellgramites, crayfish, leeches, and dragonfly larva. These macro-invertebrates were parts of all the group taxa, showing promising signs of a diverse ecosystem within the James. Also today all the campers canoed around 18 miles on the James river. That trip took around 8 hours with a few stops here and there. As soon as we arrived on the campgrounds we took a wagon trip up to a mountain top and learned and viewed the York river. Here is a fact, the York river flows into the James at T shape unlike most rivers which flow at a Y angle. The scientists tested three water quality items today: dissolved oxygen, nitrates, and phosphates. All readings were good, with dissolved oxygen at 10 PPM, phosphates at 0.1 PPM and nitrates at 0 PPM. We also discussed macro-invertebrate collection, deciding to do it tomorrow afternoon. Dinner was fantastic. Chicken and tofu fajitas, Thanks to our great cooks Anna, Nash, Sid and Hadley. Before dinner, we swam in the water and some of us fished. Mr. Draper showed us how to take a cool under water picture with the GoPro. A perfect end to a perfect day, was the campfire. We sat around the fire and had a good chat before heading to bed. When we woke in the wonderful backyard of our dear friend Jimmy, we got to enjoy some great oatmeal. We soon got to work on packing up all of our supplies and learned some new bow directional strokes. We then carefully organized the gear into the canoes and then started going to Arcadia. We hit some class II + rapids and we all successfully made it (and no one got injured). With the help of Kyle, we learned how to maneuver into eddies. We then got the chance to float down rapids after a long walk in the wrong direction. During the trip there was a lot of flat water that we got to float down. There was beautiful scenery and animals such as falcon, bald eagle, and cows. Kyle taught us how to stand in our boats and Kayleigh decided to stand on the gunnel of the bow and then fall in. When we pulled into camp around 2:30 we quickly set up tents and camp. We then had our lunch which we quickly ate and then we packed up all extra materials so we could go into our tents while the thunderstorm passed. After the storm, we all got time to play in the river. Some of us got to skip rocks catch fish and crayfish, built rock cairn (rock totems) and collected interesting rocks and item from the water. We then enjoyed a filling dinner before experimenting with melting fruit snacks. We then had lovely conversations around a slightly dying fire before going to bed. After waking up to a gorgeous pink sunrise with the James River roaring in the background, we learned proper techniques for canoeing down whitewater. Shortly after, the staff showed us how to ferry rapids like pros, and then made us do it on our own. We learned how to maneuver a canoe from the bow and the stern and that communication is extremely important when on the water. Afterwards we embarked on our 8 mile leg of the journey. The first set of rapids proved challenging for some but shortly we all felt more confident with our strokes. At Springwood we stopped and mudded through a pristine waterfall where many campers dunked their heads in the frigid water. Towards the end of our journey we maneuvered past a big fallen tree where most of our group went left where there was more space; however a couple of adventurous campers went right through a tight space and almost got stuck on fallen debris but ultimately made it successfully through. Our crew navigated through old broken down bridges which proved to be an interesting adventure. While we were cruising down a horseshoe bend, we spotted a baby deer sleeping on a rock outcrop right above the river. Once we set up camp at a friend of the James River Association’s farm, we embarked upon a mile and a half tubing escapade. A few of us ended up paddling vigorously instead of floating peacefully which made their endeavor more stimulating. We are learning how to be cooks, scientists, leaders, reporters, and creators while discovering the upper James River.